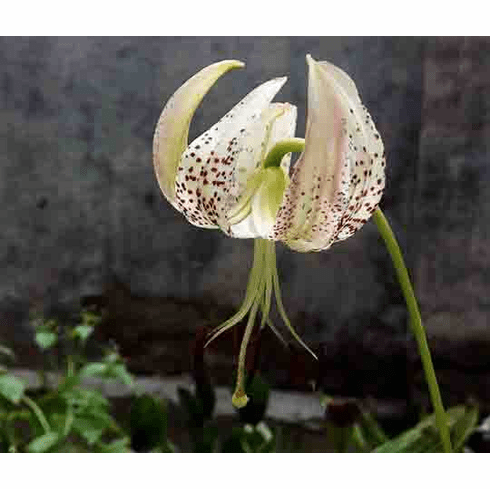 Found growing in the western Yunnan, Yijia Wang is propagating this lily at his nursery in China. Being grown now in a sandy soil with little organic material, Mr. Wang reports that the bulbs are at their largest about 1 inch across but feels they would grow larger, quicker in a richer soil. This is a very short alpine only reaching about 12 inches at maturity. It is different than both L. wardii and L. lankongense and could possible be a natural hybrid, but only time will tell. Yijia Wang offers seed of several Chinese Alpines at his nursery at www.canursery.com though as of this writing in January of 2019, no seed was being offered of this particular selection. Photos copyrighted Yijia Wang, all rights reserved. Used with permission.